Illumion are a Dutch symphonic prog band consisting of founder member Eveline van Kampen (electric and acoustic guitars, erhu, mandolin, backing vocals), Esther Ladiges (vocals, percussion), Peter Boer (six-string and fretless bass, stick, double bass, Moog Taurus 3, backing vocals), Gerton Leijdekker (keyboards, acoustic and electric guitars, guitar-synthesizer, backing vocals) and Tom Rutgers (drums, percussion). 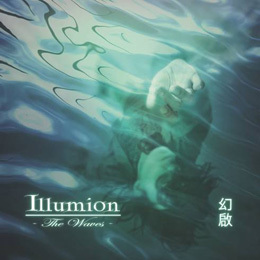 So far Illumion recorded the demo album Into The Labyrinth (2004) and the full-fledged album Hunting For Significance (2009). Recently they released their second CD The Waves featuring Arjen Lucassen (Ayreon), who lends his voice on the track Mystify. The new album contains a blend of symphonic, jazzy and heavy rock. The music can hardly be compared to anything or anyone else in the prog scene which certainly is a tremendous achievement nowadays! Illumion really impressed me; this is what prog rock should be like! The nine long and complex songs contain influences from art rock, jazz-rock and world music from both the Spanish and the Chinese culture. You'll hear Asian folk, jazz blended with flamenco, symphonic prog and heavy metal. If you mix David Sylvain, Curved Air, Kate Bush, Peter Gabriel and The Gathering then somewhere in the middle you'll find Illumion. All tracks contain a distinctive feature which can be described best as 'serenity'. Once in a while I have the pleasure to listen to a unique album; The Waves is such an album. Yet I have one remark. The record sounds like a thoroughbred studio project, so I'm very curious to see them play live on stage. If they succeed in performing this stunning music on stage as well, Illumion have all the ingredients to conquer the world! The Waves is available as a nine-track CD as well as a double vinyl album with eleven tracks. Unfortunately I'm not familiar with these two additional tracks. However, Freia Music released a fine product on both vinyl and CD, but I seriously doubt whether this kind of releases still remain profitable in the future. In my opinion future music distribution will become completely digitized. Nevertheless, I wish Freia Music all the luck and I would like to compliment them with this and other h igh quality releases.